Zeezok Publishing's Z-Guide to Father Goose is a great way to incorporate media into your study of World War II in the Pacific. Walter Eckland enjoys his carefree bachelors life, friendly natives, beautiful islands and a tropical climate. Then the war comes along and spoils everything. The Royal Australian Navy impresses him into the coastwatching service on Matalava Island. Sent to Bundy Island to pick up his replacement he finds instead a schoolmistress and seven female students who need rescuing. A mini-war erupts on Matalava as the prim and proper Miss Catherine Freneau seeks to shield her students from Mr. Eckland's slovenly habits and coarse manners. To make matters worse Japanese patrols are closing in on their whereabouts. Father Goose is a hilarious comedy with an unbelievable ending! This guide contains a topic overview movie synopsis and ten learning activities based on this exciting film. Learn more about the coastwatching service and plan your own coastwatching experience. Write a letter on behalf of Commander Houghton to His Majesty King George VI requesting royal approval of Mr. Eckland's appointment as coastwatcher on Matalava. Design a recruitment poster or develop your own code to safely transmit messages to headquarters. Probe the directors mind with The Filmmakers Art activity. Engage the entire family with the For Family Discussion section and World War II coloring pages for the younger siblings. Are you coastwatcher material? Find out with our guide to Father Goose! Movie Summary: Cary Grant stars in one of his funniest roles as a boozy beachcomber sitting out World War II in peace until the Allies recruit him to be a lookout on the South Pacific isle. During an enemy attack he answers a distress call and discovers a beautiful French schoolmarm (Leslie Caron) and her seven girl students. And so begins a hilarious battle of the sexes between a messy American a prim Mademoiselle and seven mischievous little girls. Who will win is anybody's guess but you can be sure that Father Goose delivers plenty of romantic fun and adventure along the way. 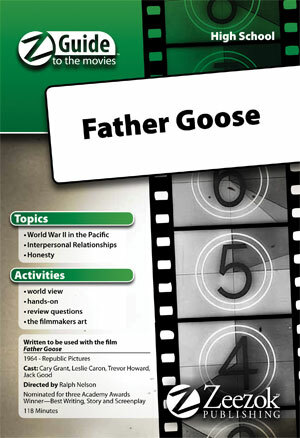 This Z-Guide is based on the movie Father Goose (1964). You can view a trailer for the movie below.